Angela Alaimo O’Donnell. Still Pilgrim. Paraclete Press, 2017. 77 pgs. $18.00. The first thing readers might notice about Angela Alaimo O’Donnell’s latest collection, Still Pilgrim, is that the title character is an ordinary (if more attentive than some) woman meandering through this ordinary (and yet extraordinary) world. She is observant and devoted and also witty. Hurtling through space at thousands of miles per hour, her world seems to preclude stillness, yet she seeks it nevertheless and occasionally even finds it. Her outer world, in which she watches her mother undress and later dresses her own son, reads poetry and visits museums, listens to Frank Sinatra and fries pork chops, guides her pilgrimage inward. This collection confirms what every pilgrim learns—every journey is a journey to the interior. The poems are near-sonnets (she refers to them as sonnets, but I am more curmudgeonly conservative on these matters), 14 rhymed lines close to iambic pentameter. Through the collection, the poems demonstrate how flexible a form the sonnet can be. Despite the consistent iambs, O’Donnell’s rhythm varies through strategically placed caesuras, polysyllabic words juxtaposed against monosyllabic ones, hard consonant sounds interspersed among softer ones. The rhymes, too, vary in tone, from somber to hopeful to humorous. The variety O’Donnell exhibits within the comparatively restrictive form mirrors the construction of the speaker, always identified only as “the pilgrim” but nevertheless developed as a round character with moods and worries and insights, successes and failures. Find the fish you need to kill and kill it. on ice, then eat it cold, smoked, and blue. after it’s had its way so long with you. the sea into your world and down your throat. whom you dispatched and served upon a dish. when you would be the one that got away? With the repetition of “kill it,” the first line of this stanza recalls the first line of the poem, its meaning emphasized by the insistent internal rhyme: “kill…will still.” “Still” here also evokes the “still pilgrim,” though in this poem her spirit seems anything but still. The pattern of rhyme means that we’ll notice one more instance two lines later, “spill,” but again that line contains an internal rhyme with “till.” The line between includes the off rhyme of “skull.” The sonic effects are appropriately forceful, aligned with this content, an obsession, a haunting, of a person determined to rid herself of “the fish” she needs “to kill.” Obsessions can never be truly killed, of course, as Melville’s novel teaches us. The last lines respond to the colloquial expression, “fish story,” in the title: “Did you really believe there’d come a day / when you would be the one that got away?” She will never, in other words, get away. Perhaps the “fish story” is the one she’s told herself—that she could get away. Ironically, pilgrims don’t generally try to escape their obsessions but rather walk toward them. Those who flee end up like Jonah, awash in the stinking bodily fluids of the beast that will force them to face their calling. Pilgrims aren’t necessarily prophets—through their more contemplative practices, they can often seem the opposite of prophets—but the two roles share at least one characteristic, the near impossibility of being declined. again. I will not do the math. Again I sing my pilgrim song. Again I am where I belong. 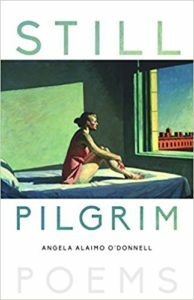 Is a pilgrim simply a restless soul, unable to sit still, to take a vow of stability, a mendicant rather than a monastic? Perhaps. But this pilgrim recognizes her pattern of departure and return, the rhythm created by walking the same path. By the end of the poem she recognizes the foundation of her calling, not to go where she is not, but to be where she is. O’Donnell includes an afterword that I found particularly insightful in its discussion of the origin of these poems. Her description of her visit to Melville’s grave reveals something we readers often know but seldom accept—the coincidental, associative, and indirect nature of artistic inspiration. These poems do have an autobiographical origin, but as with much art, it’s not what many readers might predict. The book is also one that readers might not predict, featuring a speaker who can be serious about her faith without being dogmatic, who is comfortable with paradox, who trusts that her life has meaning even when that meaning remains partly obscured. This entry was posted in Uncategorized on November 21, 2017 by Lynn Domina.